DRIVER CONFIDENCE PACKAGE includes (UFT) Side Blind Zone Alert, (UFG) Rear Cross Traffic Alert and (UD7) Rear Park Assist, LT CONVENIENCE PACKAGE includes (AVJ) Keyless Open, (BTM) Keyless Start, (5H1) Key System, (AG9) driver 6-way power seat adjuster, (N34) leather-wrapped 3-spoke steering wheel, (EGI) Deluxe Cloth/leatherette seat trim and (D7A) body-color door handles with chrome accents, KEYLESS OPEN with panic alarm, TRANSMISSION, 6-SPEED AUTOMATIC (STD), CHEVROLET INFOTAINMENT SYSTEM with 7 diagonal color touch-screen, AM/FM stereo voice pass-through technology, includes Bluetooth streaming audio for music and select phones; featuring Android Auto and Apple CarPlay capability for compatible phone (STD), ECOTEC TURBO 1.4L VARIABLE VALVE TIMING DOHC 4-CYLINDER SEQUENTIAL MFI (138 hp [102.9 kW] @ 4900 rpm, 148 lb-ft of torque [199.8 N-m] @ 1850 rpm) (STD). TheCarConnection.com explains . 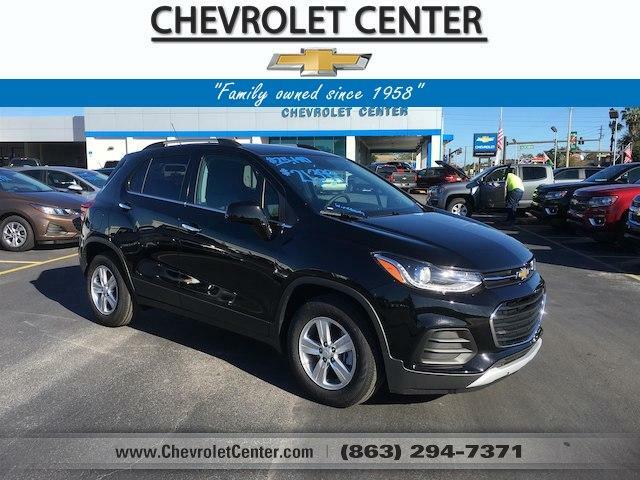 the 2019 Trax comes with 10 airbags, a rearview camera, and stability control. Those airbags, combined with a solid safety cage, earned it a five-star overall rating from the NHTSA..